Copyright: © 2017 Lakshmi V, et al. This is an open-access article distributed under the terms of the Creative Commons Attribution License, which permits unrestricted use, distribution, and reproduction in any medium, provided the original author and source are credited. Ceriops tagal Linn. Synonyms C. Candolena belongs to the family Rhizophoraceae. It is a mangrove plant with small, straight stemmed tree, upto 9 m. in height. Sometimes aerial, roots are also found along the coastal forests of peninsular India, in the Sunder bans of West Bengal and Andaman and Nicobar Islands. Bark is white, fairly smooth, leaves are pale green 5-10 cm x 3-6 cm, oblong, glabrous, thick small flowers, white or pale green in clusters of 2-10 on the apex of new shoots, fruits dark brown, 1.5 -2.5 cm long adical exhibiting vivipary. Two species, C. decandra and C. tagal, are widely distributed along the sea coasts of Africa, South Asia, and South Pacific islands . These plants are used as a folk remedy e.g., against sores . The plant possesses astringent properties, the decoction of the bark is used to stop hemorrhage and is applied to malignant ulcers  Shoots are used as a substitute for quinine in Africa . The boiled fruits are eaten in Andaman . A literature survey of this plant revealed that leaves of both the plants are rich source of tannins, fatty acids, triglycerides, organic acids, sterols and pentacyclic triterpenoids . C. tagal has been previously investigated chemically by Chinese workers . We have also selected this plant material for detailed chemical investigation. In the present communication we have isolated and characterized 12 chemical compounds from the leaves of this plant and antidiabetic activity was evaluated of these compounds. Leaves of Ceriops tagal were collected from intertidal regions of South Andaman of India. Preliminary identification of the plant was made by the Botany Division of our Institute. A voucher specimen (No. 410) has been kept in the Herbarium of the Botany Department, Central Drug Research Institute, Lucknow. Air dried leaves (1.0 Kg.) were powdered and pulverized with 95% ethanol (5 x 5.0 lit) at room temperature. The combined extracts were filtered and concentrated under reduced pressure in rotatory evaporator below 500°C to dryness. The ethanol extract (yield 3% of the plant material) was fractioned into n-hexane (yield 0.491% w/w g), chloroform (yield 0.423% w/w g). 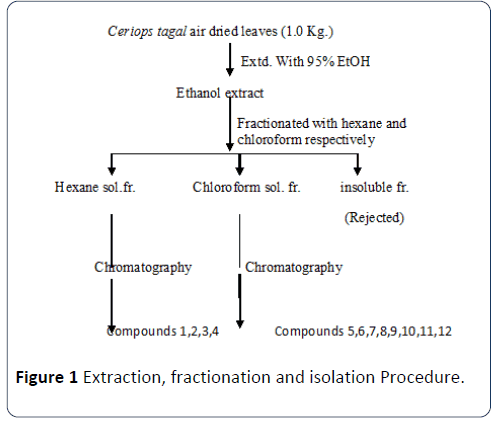 The repeated chromatography of the hexane and chloroform and fractions followed by purification by various chromatographic afforded 12 pure compounds (Figure 1). Figure 1: Extraction, fractionation and isolation Procedure. The ethanol extract of the plant was fractionated in to 4 fractions. The hexane and chloroform fractions were chemically analyzed. Twelve compounds were isolated and characterized. It was obtained as oily viscous liquid which crystallized in methanol-chloroform to give colorless crystalline solid; mp. 62-640°C. Its IR spectrum displayed absorption at 3311 cm-1, 1706 cm-1 was assignable to the COOH grouping. In the EIMS it displayed a molecular ion peak at m/z 256 [M+] corresponding of the molecular formula C16H32O2. On the basis of these spectral analyses the structure of compound-1 was identified as palmitic acid. Its identity was finally confirmed by Co-TLC with authentic sample and comparison of spectral data with those in literature . It was obtained as an oily viscous liquid which was crystallized out in methanol-chloroform to give white crystalline solid; mp 660°C. It showed IR absorption bands at 1705 cm-1 (carbonyl) and 3330 cm-1 (hydroxyl). Its mass spectra displayed molecular ion peak at m/z 284 analyzed for C18H36O2. These fragments suggested it was long chain hydrocarbon having carboxylic grouping. The 1H NMR exhibited signals at δ 2.25 (2H, t), 1.64 (2H, m), 1.23 (28H, m) and 0.87 (3H, t J=5.8 Hz). On the basis of these spectral data compound-2 was characterized as Stearic acid. Its structure was finally confirmed by comparison of Co-TLC and reported data for authentic sample . It was obtained as colorless granules, crystallized in acetonechloroform mixture, mp 48-50°C and gave positive Libermann- Burchard test for triterpenoid. Analysis of IR spectrum suggested the presence of a terminal double bond (3050, 1630 888 cm-1) and an ester group (1735 cm-1). The EIMS spectrum displayed a molecular ion peak at m/z 665 [M+H]+ corresponding to the molecular formula C46H80O2.On the basis of spectral analysis and Co-TLC with authentic samples. These analysis suggested structure of compound-3 as lupeol-3- palmitate. Finally its structure was confirmed by comparison of its data with those reported in literature . Compound-4 was obtained as white amorphous powder, which gave positive Libermann-Burchard test for triterpenes. The EIMS of compound displayed molecular ion peak at 614 [M]+ corresponding to molecular formula C41H54O4. On the basis of spectral and chemical studies compound-4 was identified as p-acetyl coumaryl ester of lupeol, which is first time isolated and identified from nature although non acetylated analogue was previously isolated from Australian acacia . It was obtained as colorless needles from methanol, mp 1360°C and gave a positive Libermann-Burchard test for steroid. Its IR spectrum showed absorption band at 3400 cm-1 (OH) and 1664 cm-1 (C=C). Its EIMS exhibited a molecular ion peak at m/z 414 [M+] corresponding to the molecular formula C29H50O. On the basis of above evidences compound-5 was identified as a β-sitosterol. Finally its identity was confirmed by comparison of its spectral data with those reported in literature  and also comparison by Co-TLC with authentic sample. It was obtained as an amorphous powder and was crystallized in methanol-chloroform mixture, mp 2100°C, [α]D +270 (c, 2.0 CHCl3) and gave positive color in the Libermann- Burchard reaction for triterpenoid, its IR spectrum showed characteristic peaks at 3400 cm-1 (OH) and 1640 cm-1 (C=C). Its EIMS showed a molecular ion peak at m/z 426 corresponding to the molecular formula C30H50O. On the basis of the chemical and spectral studies Compound-6 was identified as lupeol. Finally its identity was confirmed by comparison of its spectral data with those reported in literature  and Co-TLC with authentic sample. Compound-7 was obtained as amorphous powder and crystallized with chloroform-methanol mixture, m.p. 280-2840°C. It showed positive coloration for Libermann- Burchard test for terpenoids. The IR spectrum of the compound exhibited characteristic absorption bands at 3435 (OH), 1642 (C=C) and 1690 cm-1 (C=O) indicating the presence of hydroxyl, double bond and carbonyl grouping the molecule. The EIMS of the compound displayed a molecular ion peak at m/z 456 [M]+, corresponding to the molecular formula C30H48O3. On the basis of the spectral analysis of the compound and by comparison of its spectral data with those reported in literature  compound-7 was identified as 3α-hydroxylup- 20(29)-en-28-oic acid. Compound-8 was obtained as white crystallite powder with chloroform-methanol, m.p. 236-2380°C. It exhibited positive coloration for Libermann-Burchard test for terpenoids. The IR spectrum of the compound exhibited characteristic absorption bands at 3400 (OH), 3080, 1648 cm-1(C=C) and 895 cm-1 indicating the presence of hydroxyl group and double bond in the molecule. The EIMS of the compound displayed a molecular ion peak at δ 442[M+] corresponding to the molecular formula C30H50O2. On the basis of the chemical and spectral analyses compound-8 was identified as betulin (3β-hydroxy-lup-20(29)- en-28-ol). Finally its identity was confirmed by comparison its spectral data with those reported in literature for betullin  and Co-TLC with the authentic sample. It was obtained as fine needles in methanol, m.p. 274-2760°C and gave positive Libermann-Burchard test for terpenes. The IR spectrum of the compound of the compound showed the absorption band for hydroxyl group (3434 cm-1), an acid carbonyl (1668 cm-1) and terminal double bond (3090, 1642 and 883 cm-1). The EIMS spectrum showed peak at m/z 456 [M+] corresponding to molecular formula C30H48O3. The spectral data suggested that the compound to be a pentacyclic triterpene with lupane skeleton containing one carboxylic and one hydroxyl functionality. Finally it was identified as 3β- hydroxy-lup-20(29)-en-28-oic acid by comparison of above data with those of reported in literature . It was obtained as a colorless powder and crystallized in chloroform-methanol mixture, m.p. 2870°C and gave a positive coloration in the Libermann-Burchard test for terpenoids. Its IR spectrum showed characteristic absorption bands at 3436 cm-1 (OH), 1705 cm-1 (OH) and 1650 cm-1 (C=C). Its EIMS indicated the presence of a molecular ion peak at m/z 456 corresponding to the molecular formula C30H48O3. On the basis of the spectral and chemical studies Compound-10 was identi ied as ursolic acid. Its identity was initally established by Co-TLC with authentic sample and comparison of its spectral data with those reported in literature . It was obtained as colorless needles, m.p. 293-2950°C and gave positive Libermann-Burchard test for terpenoids. The IR spectrum showed absorbance at 3462 cm-1, 1691 cm-1 and 1647 cm-1 indicated for the presence of hydroxyl, carbonyl group and double bond in the molecule. The EIMS showed a molecular ion peak at m/z 456 [M]+. On the basis of the spectral data Compound-11 was identified as oleanolic acid. Finally the structure was confirmed by Co-TLC with authentic sample and comparison of its physicochemical data with those reported in literature . The compound Compound-12 was obtained as white amorphous powder and crystallized from chloroformmethanol mixture, m.p. 2770°C and gave positive test with Libermann-Burchard reagent for steroid and Fiegel test for glycoside indicated compound to be a steroid glycoside. Acid hydrolysis of the compound furnished a sugar and an aglycon. The sugar was identified as glucose by Co-TLC with authentic sample. On the basis of spectral analyses and co-TLC with authentic sample aglycon, was identified as β-sitosterol. These analyses suggested the compound Compound -12 to be β- sitosterol-β-D-glucopyranoside. Finally its identity was confirmed by comparison of its spectral data with those reported in literature  (Table 1). Table 1: Chemical constituents of Ceriops tagal (leaves). * First time isolated from this plant. ** New compound. PTPase inhibitory activity of test samples was determined by modified method of Goldstein, et al. Assay was performed in a final volume of 1.0 ml in reaction mixture containing 10 mM pNPP, 50 mM HEPES buffer (pH 7.0), 1 mM DTT, 2 mM EDTA enzyme protein. The reaction was stopped after 30 minutes of incubation at 37°C by the addition of 500 μl of 0.1 N NaOH and the absorbance was determined at 410 nm. A molar extinction coefficient of 1.78 × 104 M-1cm-1 was utilized to calculate the concentration of the p-nitrophenolate ion produced in the reaction mixture. PTPase activity was expressed as n mol. of pnitrophenol formed/min/mg protein (Figure 2). Figure 2: Chemical Structures of the compounds. Table 2 presents percent inhibition of the ethanol extract, hexane fraction, chloroform fraction and 12 compounds isolated on PTPase activity. The hexane fraction showed an inhibition of around 50.4% on PTPase activity. Further 12 compounds were isolated from the hexane fraction, and out of them 10 compounds showed more than 80% inhibition against PTPase enzyme activity at 100 μg/ml concentration (Table 2). Table 2: In-vitro effect of the crude extract, fractions and pure compounds of C. tagal leaves on PTPase activity. In the present study we reports the bioassay guided isolation and characterization of 12 compounds from the leaves of the Ceriops tagal. All these 12 compounds reported were isolated from the active hexane-chloroform fractions of the leaves as Palmitic acid, Stearic acid, Lupeol-3-palmitate, pacetyl coumaryl ester of lupeol, β-Sitosterol, Lupeol, 3-epibetulinic acid, Betulin, 3β-hydroxy betulinic acid, Ursolic acid, Oleanolic acid, β-Sitosterol-β-D-glucoside. Out of these 12 compounds isolated, Lupeol-3-palmitate, Lupeol, 3-epibetulinic acid, Betulin, 3β-hydroxy betulinic acid, Ursolic acid, Oleanolic acid, β-Sitosterol-β-D-glucoside have been isolated for the first time from this plant and p-acetyl coumaryl ester of lupeol was characterized as new compound and was reported for the first time from this plant. The structures were established by physicochemical techniques. Out of these 12 compounds the activity was localized in four most active compounds showing results at 100 μg/ml inhibition of PTPase activity, Stearic acid (94.2%), Betulin (94.4%), (β-hydroxy betulinic acid 90.5%) and (ursolic acid 91.6%). From the present study we came to the conclusion that the some synthetic analogs of these active molecules are required to enhance the bioactivity and antidiabetic drug may be developed. The authors are thankful to the Director Central Drug Research Institute, Lucknow, India for providing necessary research facilities to carry out this work. Authors are also grateful to the Council of Scientific and Industrial Research New Delhi for providing financial assistance in the form of fellowship to Rajesh Kumar and Emeritus fellowship to lakshmi V by UGC, New Delhi. Shukla, Chandel PS (1991) Plant ecology and soil science. Chand S and Company Ltd. New Delhi. Lin P, Fu Q (1995) Environmental ecology and economic utilization of mangroves in China. Higher education press, Beijing. Rastogi RP, Mehrotra BN, (1991) Compendium of Indian medicinal plants. Publications and Information Directorate, New Delhi 1. Kartikar KR Basu BD (1935) Indian medicinal plants. Basu Publishers. Chopra RN, Nayar SL, Chopra IC (1956) Glossary of Indian medicinal plants. Council of Scientific and Industrial Research, New Delhi. Sangal PM (1971) Forest food of the tribal population of Andaman and Nicobar Islands. Indian Forester 97: 646-650. Ghosh A, Misra S, Dutta AK, Chaudhury A (1985) Pentacyclic triterpenoids species of mangrove. Phytochemistry 24: 1725-1727. MaltaV, Cellotti G, Zanelti R, Martelli F (1971) The structure of the C-form of stearic acid, determined from powder. J Chem Soc 548. 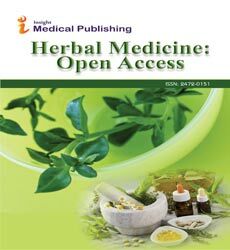 Lin CN, Tome WP (1988) Antihepatotoxic principles of Sambucus formosana. Planta Medica 54: 223-224. Ali M, Heaton A, Leach D (1997) Triterpene Esters from Australian Acacia. J Nat Prod 60: 1150-1151. Ahmad W, Ahmad Z, Malik A (1992) Stigmasteryl galactoside from Rhynchosia minima. Phytochemistry 31: 4038-4039. Iribarren AM, Pamilio AB (1984) Phytochemical Methods. A guide to modern techniques of plant analysis. Phytochemistry 23: 2086. Sholechin M, Yamasaki K, Kasai R, Tanaka O (1880) A new 28-norlupane triterpenoid. Chem Pharm Bull 28: 1006. Kitajima J, Shindo M, Tanaka Y (1990) Two new triterpenoid sulfates from the leaves of schefflera octophylla. Chem Pharm Bull 38: 714. Brian G, Michael BD, Bong CY, Nicholas LG, Bruce JL (1985) Isolation of Betulin and Rearrangement to Allobetulin, A Biomimetic Natural Product Synthesis. J Chem Educ 84. Rassol N, Khan AQ, Malik A (1989) Psoracinol, a new lupane-type triterpene from Psoralea plicata. J Nat Prod 52: 749-752. Siddiqui S, Hafeez F, Begum S, Siddiqui BS (1988) Oleanderol, a New Pentacyclic Triterpene from the Leaves of Nerium oleander. J Nat Prod 51: 229-233. Papanov G, Bozov P, Malakov P (1992) Triterpenoids from lavandula spica. Phytochemistry 31: 1424-1426.